Everyone knows Jimmy Fallon is never one to turn down a challenge, especially when it comes to lip sync battles. However, in his latest battle against Dwayne Johnson, it looks like he may have met his match. 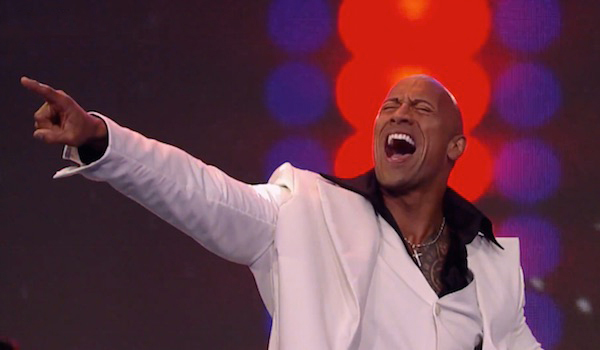 Watch as The Rock performs this epic rendition of the Bee Gees' “Stayin' Alive” on Spike's Lip Sync Battle. The Bee Gees haven't looked this good since they released their hit disco track “Stayin' Alive” back in 1977. As you can see in the above vid, Dwayne Johnson brings a whole new modern vibe to the track while also holding true to its original disco style. I think the brother's Gibb would most certainly approve. While Fallon absolutely brought it on his Madonna “Like A Prayer” rendition, Johnson undoubtedly stole the show... something tough to do when you're up against The Tonight Show pro. The thing that makes Johnson's performance so good is his willingness to let go and put on a show. The Furious 7 star always brings his A-game. Just look how he works the camera. The entire performance was spot-on, from the lights, to the dancers, to the costumes; in essence the entire production was top-notch. Leave it to The Rock to incorporate the spectators, handing one female fan a pretty sweet piece of memorabilia. Johnson has been all over recently, doing promotion for his latest film Furious 7, which hit theaters yesterday. One notable stop along the way was his hosting last weekend's Saturday Night Live, in which he (and a mock cast of Furious 7 actors) took part in a live-action remake of Bambi and reprised his iconic character The Rock Obama.